In highly dusty areas it can be required by the States to water down the ground when construction is being done to limit the potentially harmful particulates in the air caused by dirt and sand being stirred up by traffic. Due to the fact that many construction areas do not have access to water, many locations are provided with water by utilizing a water truck that trucks water in from long distances. In the past decade or so, many construction companies have saved water by digging a hole near the construction site and filling the newly made construction pond with water. This enables construction companies to save a great deal of money by not having the need to bring in new water trucks frequently. Most newly dug construction ponds unfortunately do not hold water by themselves and need an affordable liner to hold the water temporarily while construction is being done. 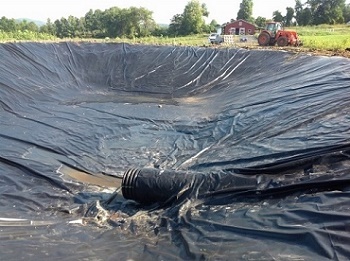 Western Environmental Liner has multiple options of liner material that can be used as temporary construction pond liners or for more long lasting projects. Since almost all construction jobs last less than two years our Aqua 12 liner is very popular for its affordability. Sometimes our customers want a little more protection due to the environment and go with our Aqua 15. We have had a few very long construction job inquiries where a customer decides to go with our Aqua 20. Whatever construction pond liner you choose we will be sure to steer you in the right direction. Please think of Western Environmental Liner for your next construction job.